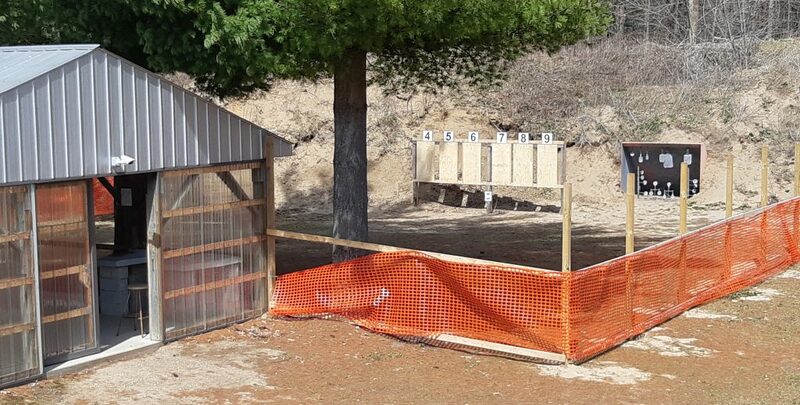 We have an outdoor handgun range and pavilion with paper target only boards at 10 yards 20 yards and a reactive target bunker (gongs) at 25 yards . All hand gun calibers and rimfire rifles are allowed on this range . Our indoor range is a 20 yard bulls eye range . There are 6 shooting stations. Both rimfire and centre fire handgun ammunition my be used, but full metal jacket bullets/armour piercing bullets are prohibited. With the exception of the summer months, June, July and August, the indoor handgun range is reserved for target shooting on Tuesday evenings. Twenty yard, slow fire targets are provided. These are regulation targets purchased from the Shooting Federation of Canada. If you prefer, you may use paper targets that are available commercially. Those with only outdoor memberships are welcome, but must pay a $5 range fee each night. In the summer , the outdoor handgun range is more comfortable, and may be used at any time that doesn’t conflict with other regularly scheduled or special events. The “Range Open” sign must be displayed while the outdoor range is in use. There is to be no shooting on outdoor ranges before 9:00 am or after sunset. Whether using the indoor or outdoor range, you are expected to clean it up before leaving. Don’t forget to close the indoor range; set the thermostat to “run” at 50 F in cold weather; turn out the lights, and lock up. The side door of the clubhouse is not self-locking. When leaving, lock the door from the inside and exit the front doors. Always close and lock the entrance gate. Please contact RICK SZUCSKO at 226 231 4824 or email Rick at rickyratchet@hotmail.com and if you have any questions.